The Lagos gubernatorial candidate for the Peoples Democratic Party (PDP), Jimi Agbaje has said the state government is being run in a very opaque manner. Jimi Agbaje made the assertion on Sunday at The Platforms Lagos Gubernatorial Debate. 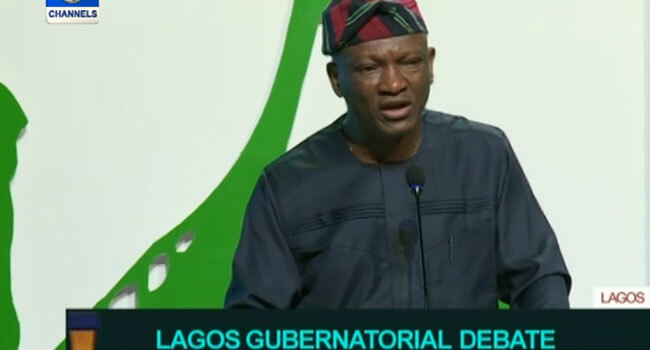 Reacting to questions regarding the running of Lagos state, Agbaje said as governor, he will Let Lagos know there is a new sheriff in town by carrying everybody along. Agbaje stressed that technology will play a key role in drive the various process that makes the state a mega-metropolis. Reacting to questions about easing traffic congestions in Lagos, Agbaje said by employing radar technology and proper town planning the state will enjoy major ease in the gridlocks commutersencounter daily. The idea is to have even development across Lagos state so that you are having less of movement from one end of Lagos to the other, Agbaje said. He argued that the different parts of Lagos must be looked into as to make them self-containing. In the educational sector, Agbaje decried the lack of access to the internet suffered by children in public schools. Technology is a new world and our children in public schools have no exposure to technology, the PDP gubernatorial candidate opined. He, however, promised that every primary school will have the internet facility adding that with an internet connection, you must have power, technology will drive the process of education. Agbaje went on to argue that the reason the schools in Lagos are yet to get fully equipped technologically and internet-wise, is because the government has continued to place obstacles in the path of those looking to equip the schools. Those that have been there for the last 20 years have put obstacles for technology, in terms of the right of way. Speaking about the health sector, Agbaje said health in Lagos is not working as it should. He said, Life expectancy is about 49years below the national average and we are at the bottom half of 26 states in terms of life expectancy. Agbaje said Lagos must look at its health differently. Speaking about how to add value to healthcare in the state, Agbaje said he is one for the manage care concept popularly called health insurance model. He said, Basically keep all members of the health team by running a scheme that revolves around the General Practitioners(GP), now you are going to employ the services of the GP, your citizens are going to determine the choice of their GP; it is your duty as a government to write a cheque, an insurance likea premium on their behalf and be the regulator.